The Herts Closed 2017 was held again this year at Radlett Squash Club, looking very smart after the alterations to the bar and lounge area. 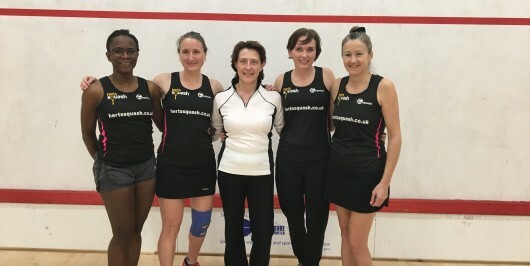 Thanks again to Kyri Costi and Radlett Squash Club for hosting again this year. The tournament had slightly less entrants than last year and suffered a quite a few pivotal players dropping out in various tournaments, but in the end this didn’t matter as all the categories were keenly contested. The Men’s B competition had a very strong entry and produced some very exciting matches. The ladies event had a strong entry also, and it was good to see Herts juniors Grace Gear and Nyah Williams in the final. The Mens A final was a great spectacle with incredible retrieving and by both Keith and Nick. Well done to Alex O’Sullivan runner up last year in the Men’s B tournament and managing to win the event this year. Thanks to everyone who entered the event and made it such a great weekend of squash.